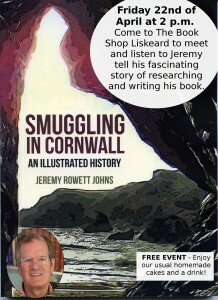 Smuggling in Cornwall an Illustrated History by Jeremy Rowett Johns. Come to the Book Shop to meet and listen to Jeremy tell his fascinating story of researching and writing the book. A free event – come and enjoy our usual homemade cakes and a drink.